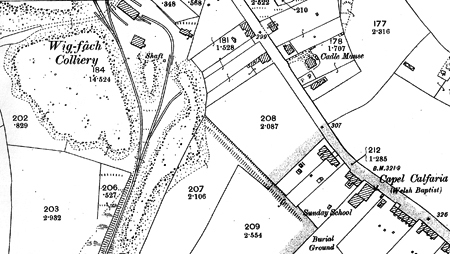 The colliery buildings (can be seen in the1899 map) then south again was the shaft. Road traffic entrance was the same as Worcester via White City Road. 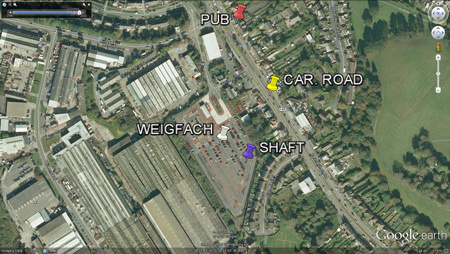 From an aerial map of today (2012) the Weigfach Colliery would have been situated in the middle to bottom end of Fforestfach park & ride car park. also further south Cwmbach colliery. All 3 collieries (OS 1879) were linked in with main railway line at Cockett, Swansea. 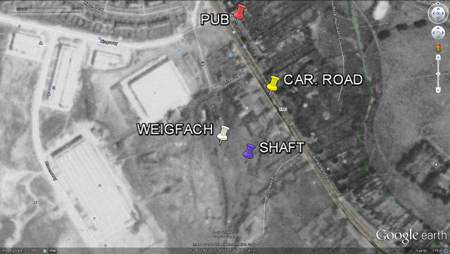 Weigfach Colliery Area - Google Earth 1945. 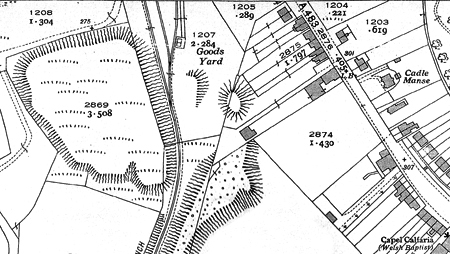 Weigfach Colliery Area reproduced from (1940) Ordnance Survey map. The colliery has long gone and now the area is being used for Cockett Goods Yard Branch. You can see Cadle Manse, which was Bethlehem's Ministerial residence for many years. PUB - Originally 'The Star' currently 'Olivers', 2012 (See Pubs & Inns). CAR. ROAD - Carmarthen Road, widened in the early 1990's. The writing source is about John Glasbrook (1816-1887) & his brother-in-law, Philip Richard I (1813-1876). Hafod to the Gorse Colliery behind Dillwyn Llewelyn School (2012) and a branch to the two collieries below. "The date of the branch to the Weig Fach and Worcester Pits, the sites of which new form part of the Fforestfach Trading Estate is not known, but it was probably not put in until the mid 1860s. Thomas Glasbrook (the brother of John) was granted a lease of Worcester by the Duke of Beaufort in 1863. The first sign that it was yielding is in 1866 when an accident is recorded at that pit, while it was not until 1870 that coal was struck at Weig Fach." 1844 Mar. 02 For sale Weig fach colliery near Swansea. (C) F56 DISASTERS AND ACCIDENTS, etc. 1845 May 03 Thomas Stick's Weig fach colliery explosion of fire damp. (C) F56 DISASTERS AND ACCIDENTS, etc. 1845 May 03 Weig fach colliery. William Thomas aged 28, killed. (C) F56 DISASTERS AND ACCIDENTS, etc. 1845 May 03 Weig fach colliery. Mr Strick, Mr Williams, surveyor, David Hugh, William Richards, evidence. (C) F56 DISASTERS AND ACCIDENTS, etc. 1845 May 03 Weigh fach colliery. Thomas Jones, overseer, William Williams, John Williams burnt. Weigfach Colliery Company Swansea: Notice from H. Gregor. Swansea: Weigfach & Margam House coal for sale - by Henry Tregaskis, Vine Cottage, Heathfield Street. Cwmbach (adjoining Weigfach) colliery, Swansea To Let. Apply WM. Thomas, Millbrook Iron Works. (C) Q50 CRIME AND PUNISHMENT, etc 1851 May 02 Swansea petty session: H. Benjamin, labourer -V- Ebenezer Davies, Weig fach colliery. (C) Q12 CRIME AND PUNISHMENT,THEFT etc 1851 May 30 Swansea petty session: P.C. Noah Owen & Weig fach Coal Company -V- Richard Morgan. (C) D20 TRANSPORT, RAILWAYS 1851 June 20 South Wales Railway Company: James Leyson; Weig fach Colliery Co; The Strand, Swansea. Glamorgan Sessions: Weigfach Company, Swansea -V- Richard Morgan, aged 18, Mason. Swansea Petty Sessions: Weigfach Coal Company -V- The Son of John Locker - theft. Weigfach Colliery near Swansea. 18 horses for sale. Weigfach Colliery. Machinery for sale. Apply William Gregor, Ravenhill, Swansea. Weigfach & Gorse Swansea, Seams for sale. (Leased to Messrs Richard and Glasbrook). 1856 June 13 Weig fach colliery near Swansea: Notice re sale of plant etc. Weigfach Colliery & Cwmbach Colliery near Swansea: Plant for sale. (C) J23 MINING, INDUSTRY-VALLEY etc 1870 Dec.16 John Glasbrook raises diamonds from Tyr canol colliery, Morriston. Success at Thomas Glasbrook's Weig fach colliery. P6. Dreadful colliery explosion at Fforestfach; near Swansea. Loss of Nineteen Lives. (C) F52 DISASTERS - EXPLOSIONS etc 1877 Mar. 30 Editorial on Weig fach Colliery explosion hints at possilbe influence of nearby fair, Mr Llewelyn's generosity praised. (C) F52 DISASTERS - EXPLOSIONS etc 1877 Mar. 30 Weig fach Colliery accident fund: Subscriptions - Morgan B. Williams; Messrs. Thomas Watkins & Jenkins. (WM) Q39 CRIME - TRIBUNALS etc 1903 Jun 05 Inquest on James Job, banksman, died alone in Weig fach Colliery. Witnesses: Fredrick Walters, banksman; Dr. Gowing. "It was Thomas Glasbrook who sank the Worcester Pit, Fforestfach, down to the five ft. seam which proved to be of very good quality bituminous coal. This colliery was worked in conjunction with the Weig Fach Colliery and Pwll Sant or "Saint's Pit." The site of the latter pit is close to the north side of the main B. R. railway line 500 yards west of Cockett Station. The actual site of the Worcester Pit is about 150 yards to the rear of the old Fforestfach Police Station now occupied by Messrs. White Remould Tyre Co."
"Weigvach", "Weig vach", "Weigfach" & "Weig fach" were used to filter the Cambrian index as best as possible with the information available on 16.07.2012. Click - HERE - to return to TOP of page.